I work in Endicott, and have long both loved and felt disappointed by Antonio's Galleria and Cafe at the same time. As a gelato shop and bar with fun cocktails, Antonio's has been successful for a long time. But as a restaurant, I have unfortunately had some really lackluster experiences there. Recently, I heard the Little Italy spot had a new chef and a new dinner menu. I was told the food was all new and phenomenal, so Big Hungry Melinda and I met there to give it a try. The interior of this small corner cafe is dim and cozy, with an upscale bar and a comfortable dining room decorated in warm colors, with a wine country feel to the furnishings. You have to walk by the gelato case to get to the dining room, which is a brilliant strategic maneuver - all that homemade goodness is colorful and nearly irresistible. We started our meal with a couple really excellent St. Germaine-spiked champagne cocktails, which were lightly sweet and effervescently refreshing. 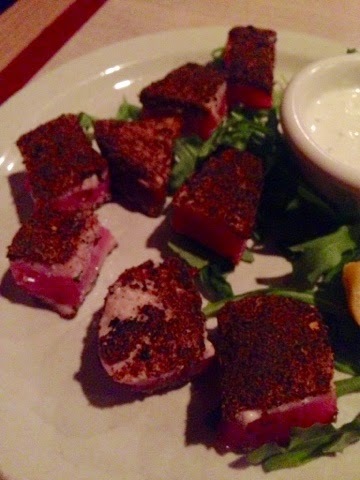 Our appetizer of choice: blackened tuna bites. These morsels of rare, super fresh fish were just hot enough with Cajun spices to give a little zing. They were served with a cooling tatziki sauce, which is usually one of my favorites, but this version was thinner that my ideal, and lacking either cucumber or garlic flavor. I loved the tuna, but the sauce just didn't do it for me. I wasn't kidding when I said it was dark in there! The salad course was simple, but one of the better comp salads I've had lately. The spring mix was crisp and clean, with big chunks of veggies, black olives, some homemade croutons and a very light, not-too-acidic house vinaigrette made with lemon juice. 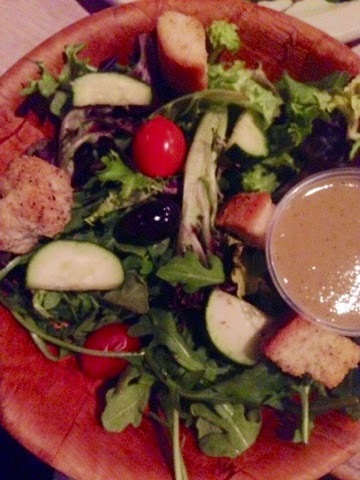 It was large for a starter salad, and just a very light, yummy starter. Unfortunately, our starters wrote checks our entrees couldn't cash. 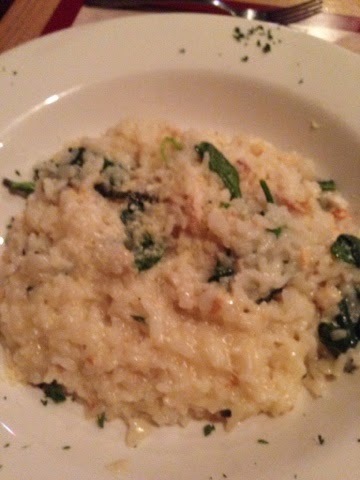 Melinda's crab risotto did not enjoy the freshness our tuna bites had. Instead of the sweet, rich flavor you want with crabmeat, there was a wiff of fishiness with each bite of the crab and arborio rice dish, which lacked any other real flavor, and was cooked much tighter than a textbook risotto should be. Risotto is meant to puddle in a dish, the cream and butter added at the end loosening up the finishing texture after all the broth is incorporated. Instead, this was cooked down into a pretty dense, dry bowl of rice. You can tell a lot about an Italian restaurant by its meatballs. It's almost a litmus test. I ordered the ravioli with mini meatballs because, with the caliber of the gelato here, I assumed the meatballs would be on point. 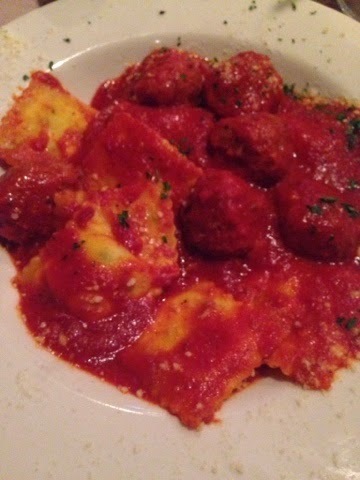 Unfortunately, my ravs were undercooked and those meatballs were dry with little flavor. The savory, bright, smooth marinara was a scant saving grace, but not enough to cook the pasta surrounding the ravioli through, nor to resuscitate the small meatballs. Usually when they're made with beef and veal, you're guaranteed a tender, flavorful product, but I didn't taste any seasoning in these. Where for art thou, cheese, egg, herbs, breadcrumbs? I'm guessing these were a fresh, frozen ravioli, because I've had the bad luck of undercooking them at home before, resulting in a similar, gummy, too toothsome pasta. Al dente is good, downright dry and chewy, not so much. Luckily, gelato saved the day! Antonio's not only uses a machine brought over from Italia, they are committed to superior, imported ingredients for this better-than-ice-cream treat. 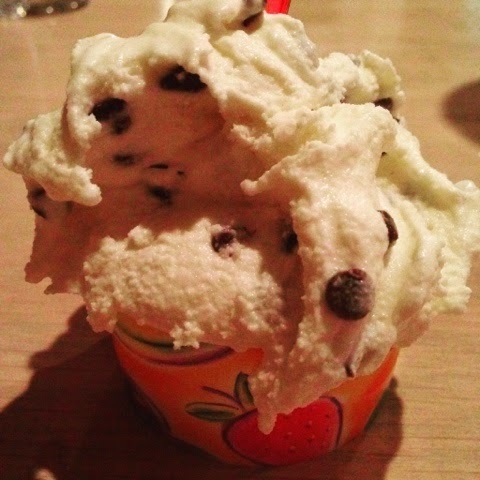 Gelato had a lower butterfat content than American ice cream, but is creamier and more dense. At Antonio's, they put real Nutella in their chocolate hazelnut variety, and real fruit I. Their gemstone colored fruit varieties. I chose mint chip for my dessert, and luxuriated in every robustly minty bite, enjoying the semi-sweet chocolate chips and appreciating the lack of saccharine sweetness. This is a grown up dessert, and you can even get their gelato incorporated into adult beverages if your after dinner needs skew boozy. When Antonio's first opened, the paninis they served alongside the gelato were very good. A few years later, they tried pizzas, but couldn't compete with Consol's thin pie and Joey's brick oven excellence. It's such a pleasure to spend an evening in this space that I hope they can fine-tune the bumps in this menu and find their niche. I want to love it here, no holds barred. The cocktails and gelato are already winners, and my salad and tuna appetizer were quite good this visit, but those mains were just clunkers. I give Antonio's latest dinner menu a five on the BHS scale - about average once you factor in all the courses we tried. I've got a bunch of great write-ups headed your way in the next few weeks, Hungries. 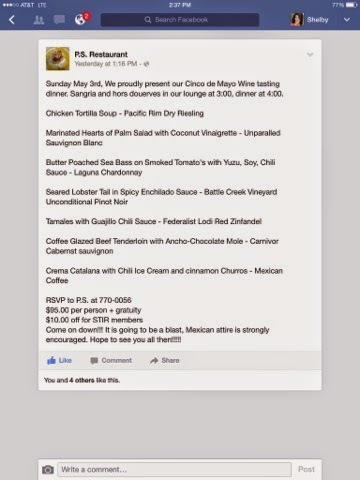 Next week, join me for an epic Mexican-themed wine dinner at P.S., in Vestal. And I'm heading to the land of the witches, Salem, Mass., next week for work, so expect a dispatch or two from there. After that, I'll share my review of a new, fancy fishing lodge north of Syracuse that's serving up fabulous eats in the middle of nowhere. Well, unless you're a fish. My personality is big; my hunger is bigger!